Dr. Gregory P. Jellenek attended Northern Arizona University where he received a B.S. in Microbiology then graduated from Southern California College of Optometry with a Doctor of Optometry degree. He’s been in practice for more than 28 years and his specialties include Family Practice, Treatment of Eye Disease and Contact Lens. He enjoys family practice to allow treatment of all ages. Dr. Jellenek has served two terms on the Virginia Board of Optometry, including as president, and served as Chief of Aerospace Optometry for the Virginia Air National Guard. 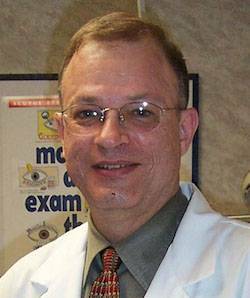 He also is a member of the American Optometric Association and the Virginia Optometric Association. Dr. Jellenek grew up in Thousand Oaks, CA. He enjoys helping with activities at St. Bede Catholic Church and spending family time with his wife, Millet, and his three grandchildren, Ali, Jak and Kat.